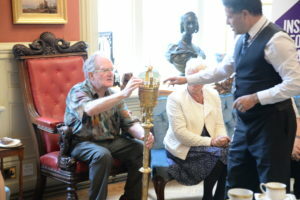 A number of our volunteers accepted a very kind invitation from Councillor Mo Marsh, The Mayor of the City of Brighton and Hove to attend a Tea Party in her Parlour on June 8th. 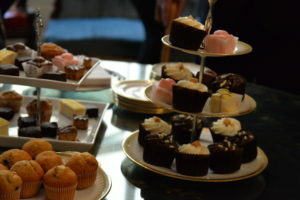 We were all treated to a delicious assortment of cakes, hot and cold drinks, followed by welcome speeches from The Mayor, and Volunteering Matters employees Emma Thomas-Hancock, Director of Volunteering and Chris Martin, Project Manager. Robert Robertson, The Mayor’s Mace Bearer then entertained and fascinated us all with a presentation around the history of the city. We all got to see some of the regalia and the maces first hand, which was quite an experience! We are most grateful to Councillor Mo Marsh for hosting a very special event. We all really welcomed this opportunity in Volunteers Week to say a special thank you not only to the volunteers present but all our other volunteers for all their sterling work. This year, we have successfully grown our project across “The Denes” and are going from strength to strength with our Healthlinlk project, recruiting n ew volunteers to support people aged 50 plus to attend health related appointments. Our long standing East Brighton work is also expanding into new sheltered housing schemes. We are particularly delighted to be working with Southern Housing, specifically at Courtney King House and are very excited to be the lead partner for the pending opening of Brooke Mead. This is an extra care housing scheme, run by Brighton & Hove City Council and will focus on supporting people who are living with dementia. Alongside our partners Fabrica and Open Strings, Lifelines will be recruiting volunteers to run dementia friendly activities such as Mindful Colouring and Reminiscence discussion groups.